Don't have an RV? Enjoy the pristine beauty of Oklahoma's Grand Lake from a furnished, private rental cabin. Monkey Island RV Resort has 16 comfortable and cozy cabins available for nightly and monthly rentals. Our cabins are new, clean and comfortably sleep two to four people with a queen-size bed and sleeper sofa in each. 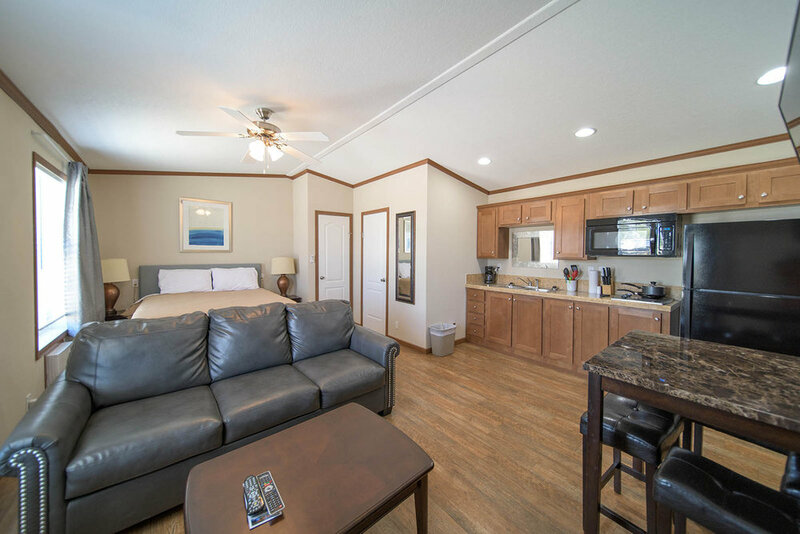 Each one of the fully furnished cabins also includes a big screen TV with basic cable, a full kitchenette with a two-burner stove and full-size refrigerator and a bathroom with a large shower. Outside, there is plenty of room to park the largest of boats in our drive and the road is paved to the cabin. Additionally, as a guest in our cabins, you will have full access to all of our resort amenities.